Conference trophies: to touch, or not to touch? 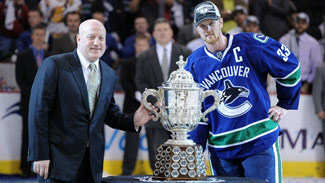 Henrik Sedin smiled, clinched his fists in celebration, but refused to do one thing -- touch the trophy. When the Vancouver Canucks won the Western Conference Championship on Tuesday night, with a double overtime victory against the San Jose Sharks in Game 5, NHL Deputy Commissioner Bill Daly presented the team with the Clarence Campbell Trophy in a postgame ceremony. Sedin, Vancouver's captain, skated over to center ice. However he opted to stand next to the trophy, rather than hoisting it into the air in front of nearly 19,000 screaming fans at Rogers Arena. Three nights later, Boston Bruins captain Zdeno Chara followed Sedin's lead after his team eliminated the Tampa Bay Lightning in Game 7 of the Eastern Conference Finals with a 1-0 win. While Chara gathered his teammates around the Prince of Wales Trophy for a quick picture, none of them laid a hand on it before skating away. "It's something we talked about, I thought it would be great to have all the guys with it," Chara said. "It's a team thing. It's something I decided to do and everybody liked it." Some superstitious players feel it is unlucky or a bad omen to hoist -- or even touch -- their conference trophies when the series have been won. TO TOUCH OR NOT TOUCH? Here is a chart since 2001 of teams who won their respective Conference championships, what they did with the trophy and the result in the Stanley Cup Final. The teams who touched it are 4-5 in the resulting Stanley Cup Final. 2011 Bruins Didn't touch ? 2011 Canucks Didn't touch ? The Stanley Cup, after all, is the true championship trophy. It's what teams have their sights on all season long, and nothing -- not even a conference title -- should distract players from the ultimate goal. Some teams adhere to this superstition, some teams don't. Here's a look at how it's played out in the past, as players have asked themselves the question: To touch or not to touch? Since 2001, teams who have touched their conference trophy are 4-5 in the resulting Stanley Cup Final. Last season, the Eastern Conference champion Flyers opted to touch the Prince of Wales Trophy -- with captain Mike Richards hoisting the hardware in front of a sea of screaming, orange-clad fans. Meanwhile, in a ceremony honoring the Blackhawks clinching the Western Conference title, captain Jonathan Toews chose to steer clear of the Clarence Campbell Bowl. He kept a safe distance from the silver trophy for photos and made zero contact with it whatsoever. Chicago ended up winning the 2010 Stanley Cup in six games. In 2009, Penguins captain Sidney Crosby was happy to grab the Prince of Wales trophy when Pittsburgh clinched the Eastern Conference title. This came one year after the Penguins opted to adhere to superstition and not touch the trophy -- then subsequently lost to the Red Wings in the Stanley Cup Final. Pittsburgh won the 2009 Stanley Cup, proving maybe it isn't so unlucky to touch a conference trophy after all. Crosby in 2009 followed the lead of 1991 Penguins captain -- and current Pittsburgh owner -- Mario Lemieux. Lemieux not only touched the Prince of Wales Trophy in 1991, when the Penguins advanced to the first Stanley Cup Final in team history, but he also skated around with it. Pittsburgh went on to win the Stanley Cup that season, in six games over the Minnesota North Stars. Some other notable captains who chose to touch the conference trophy and then went on to win the Stanley Cup are Red Wings' star Steve Yzerman in 1997 and Devils' defensive stalwart Scott Stevens in 2000 and 2003. When Chara didn't touch the trophy, it set up the third Stanley Cup Final since 2001 between two teams that didn't touch the conference trophy.